Well, 2.5 weeks and counting until Fall arrives. Has Fall managed to find its way into your home yet? I grabbed my overalls (yes, I actually do own overalls, but I promise they are super cute) I’ve been painting, using my saw, shopping and flower arranging away! One of the great things about decorating for the fall is that you don’t need much. A little goes a long way because of the colors. From muted tones to go bold or go home bright, vibrant colors, when you incorporate them into your current decor, they stand right out and give your home a sense of Fall. There are a few decor items that I think really give your home a big bang if you don’t want to go all out and I wanted to share them with you today! This post contains affiliate links for your convenience. You can learn more about my disclosures here. Y’all, just looking at these chunky throws makes me feel warm! These have become quite popular and how can they not? Imagine sitting on your couch all curled up in one of these with your glass of wine. Can it get any better than that? I love that they come in all different colors so you could get one for every season! Candles and candle holders I think are one of the easiest ways to bring Fall into your home. They come in all different shapes and sizes and are readily available! I love coming home, lighting a candle and enjoying the Fall scents like pumpkin, apple, and cinnamon. Besides the fact that they come in all shapes and sizes, another reason I love wicker baskets is that they are so easy to paint! When I go shopping, I don’t worry about the color because I know I can just spray paint the baskets. Whether you choose large baskets or small baskets, they can hold anything and add a perfect touch to any space! These may only be 3 items, but they are 3 decor items that can pack a powerful punch! What have you done to bring Fall into your home? Need more ways to decorate your home for the Fall? Download your copy of “How to Decorate Your Home For the Fall” by entering your name and email address in the boxes below! Looking For Ideas to Decorate Your Home For the Fall? Grab my home decorating guide, How to Decorate For the Fall! Success! Now check your email to confirm that you want to get emails from Back to the South. I love fall… But I live in the caribbeans so my “Fall” is the huracain seasson. So when I do a fall decor it helps me have another prespective. Yes, baskets can be expensive La Shell. Thank goodness for coupons and sales! I love these cozy suggestions! I always buy new candles every fall because festive scents really get me in the spirit of the season. Thanks for the reminder! Me too, Kate! Candles and I also grab some scents for my warmer. 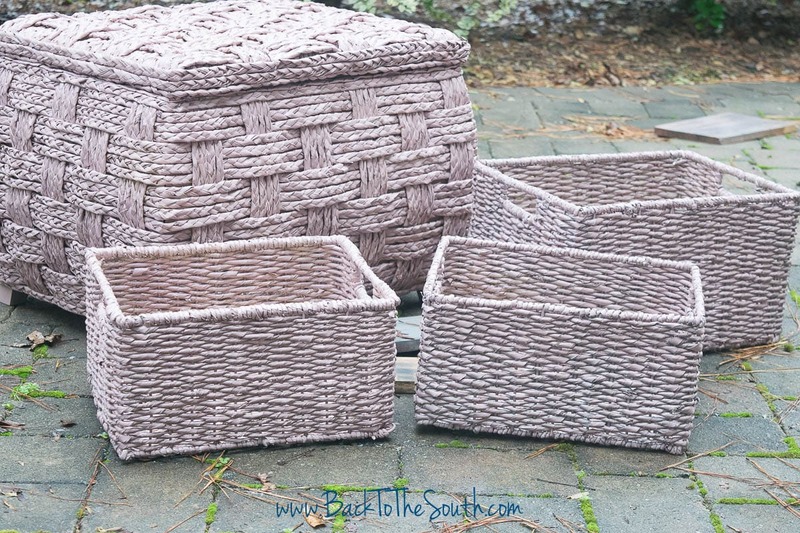 I LOVE wicker baskets — I tend to rotate the collection I have around the house every so often and they’re literally great for every season! I need to look into some cute chunky throws too — great ideas! Thanks, Marie! I’m such a sucker for a great basket! I love love love chunky throws and can’t wait to cuddle up with one! God, I love the looks of those throws! I’m planning to get several of them when we move next year for the different season and holidays for the loveseat that will be in my bedroom. Good ideas! I have been decorating for Fall this last week. I think I need to add some throw blankets in to the mix! I love the scents of fall! I had a few wicker baskets a few years ago that I dip dyed in white paint. They turned out super cute…very beachy! I have a ton of glittery pine cones I like putting in a trifle bowl too. Those sound like great ideas, Melissa! I bet those white baskets were so pretty! I love fall! These are great decorating tips! I am so ready for warm, chunky throws, beeswax candles and wicker baskets. I love fall . Thanks for the inspiration! ♡ Enjoy the season. Toss me that chunky throw, for sure! Love your idea to paint those baskets — nice touch! I love fall but it makes me sad because I know that Winter is next lol…I love the smells of Fall and all the comfort food and candles make it feel so cozy!! Wow Lynn, I love your blog especially the home deco idea. I love those chunky throws and the wicker baskets. I love love that chunky throw! It looks so warm and cozy for crisp fall mornings! I’m an absolute sucker for wicker baskets, just can not get enough of them! Never thought of spray painting them though, that’s a very good tip! Thanks, Rosanna! I wish I could just sit on the couch with blankets and hot chocolate the whole Fall Season! Loving these baskets!!! Great tips!! Candles are definitely my favorite way to bring fall into my home! I also love that you added in chunky throws, so many good items! Thanks, Sami! I love all those Fall scents for candles. They make the house smell so good! Yes!!! I really need to get a chunky throw. I’ve been wanting one for like ever! I usually accent a lot with plaid and fur throws! I love plaid. I bet that’s so pretty, Kristen! Chunky throws are my favorite!!! I love blankets and have way way too many of them in our house but I just can’t resist a nice soft and chunky thing to cozy up with! Love it! I’m all about the fall tablescapes too! Yes yes and yes! I love filling my home with warm cozy blankets, rich fall scents and wicker baskets to hold all of my extra blankets. I’m with you, Susanne! For some reason, our temps here in Raleigh have changed almost overnight. 🙁 One day it was 90, suddenly it was 75. My house is definitely missing some chunky throws! I need to bust out some fall decor! Have fun decorating! It gets me into the Fall spirit that’s for sure! I have yet to decorate for Fall yet. I’m hoping to do some decorating this weekend! I am a huge fan of candles of course!!! I need some new Fall ones! I live for the chunky throw! I was thinking of knitting one last year so many I will pick up that goal again. OMG chunky throws are the BEST! I could just collect all of them and put them EVERYWHERE!!! I love that chunky throw!! I cannot wait for the fall weather and to cuddle up on the couch with a good book and a warm sweater. I have seen so many chunky throws lately! I must get one for myself! So excited for fall and home decor! Chunky throws and candles are my jam! Chunky knit throws are a MUST HAVE!! I love mine so so much. I would love to have one of those chunky throws! I would probably never get anything done, though, because I would be laying on the couch all day! We use scented candles all year round but more so in the Fall and Winter. I really enjoyed reading your post. I love this list. Those baskets would be great in the bathroom as a hamper or a place to store clean towels and linen. The way I like to bring in Fall in my home is by buying a cinnamon broom. Thanks, Joy. A cinnamon broom? I bet your house smells sooo good!